The number of children in the U.S. that are going hungry is staggering. Just staggering. Wow, 8,000 playgrounds full of hungry children, in our own backyards. It truly is inexcusable to me that here in the United States, the land of the free, the land of the plenty, the land where many of us waste food on a daily basis… we have children hungry. And children who experience even intermittent struggles with hunger may suffer serious, long-term consequences to their health, well-being and educational achievement. What’s more, being hungry robs kids of the promise of childhood – the ability to play, grow and learn. It’s easy for us to help end child hunger. Seriously… EASY! ConAgra Foods is partnering with P&G to build a community of people to make a difference and help donate up to 7 million meals through the Child Hunger Ends Here campaign. This is a cause I will gladly support. Look for the red pushpin on specially marked ConAgra foods and P&G products and find the code. 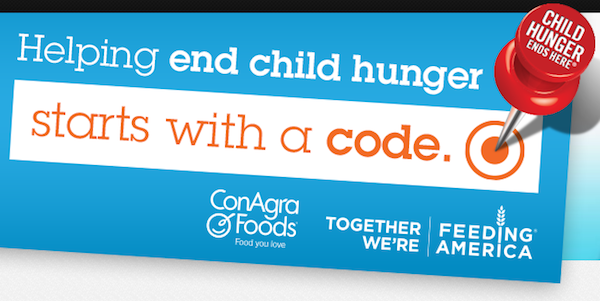 For every 8-digit code at www.ChildHungerEndsHere.com from March through August 2014, ConAgra Foods or P&G, respectively, will donate the monetary equivalent of one meal to Feeding America. Scroll up a bit, see it now? Just enter your 8-digit codes right there. Every time you go to the grocery store between now through the end of August look for the red pushpin and after you get home, come and enter your codes in the widget on the right before you put your groceries away. YOU will be making a difference! I’ll be doing the same thing. Together WE will make a difference! Grammy-nominated country music artist, Hunter Hayes, has joined the initiative in ending child hunger, too. For every download of Hunter’s new single, “Invisible” on iTunes, Child Hunger Ends Here will donate the monetary equivalent of one meal to the nation’s leading hunger-relief charity, Feeding America, up to one million meals. Would you like to attend an exclusive Hunter Hayes event, courtesy of Child Hunger Ends Here? Use your mobile device to post your favorite family photos to Instagram in March 2014 using the hashtag #HunterGramPromo for the chance to be selected for this opportunity! For each photo shared, Child Hunger Ends Here will donate one meal toward ending child hunger. Visit the HunterGram tab on the Child Hunger Ends Here Facebook page to see all of the submissions and for the winner announcement in April! An easy way to learn how you can get involved is to join the Child Hunger Ends Here Facebook community at Facebook.com/ChildHungerEndsHere or follow the news at Child Hunger Ends on Twitter and use #ChildHunger, and Instagram at @ChildHungerEnds. You can help ConAgra Foods out by taking this quick survey. Thanks! Unfortunately, I am not a huge fan of ConAgra (GMOs, chemicals etc.). They are just not inline with our organic lifestyle. But I am all for feeding the hungry. This is such a wonderful cause! I love it! I love reading about great causes, makes me feel happy. Thank you for sharing. What a great cause! I’m definitely passing this along! That’s so great that they are helping to feed the hungry. I think more corp should give back. What a great way to give back. I remember we used to have lunch programs for kids in the summer time, which was a big help for low income families. I think many cities still do one too. Excellent cause, I only wish their products weren’t so processed. Such an important cause. No child should be hungry! Great cause, thank you for sharing. So happy when brands support causes that help others who are in need! This is a great cause and it’s so easy to help out! I’m gonna go look in my freezer now. I think I remember seeing some Marie Calendars frozen dinners with that red pin on them. Those stats are devastating but I love this campaign. It’s so fantastic how much ConAgra helps. Love how easy it is to help child in need of food. How could you not help!